MK Yariv Levin calls to suspend all agreements with PA regarding Cave of Machpela until appointment of Taysir Abu Sneina is cancelled. Taysir Abu Sneina, a terrorist who was involved in the murder of six Jews in Hevron on May 2, 1980, is the man whom the Palestinian Authority has appointed to manage the Muslim side of the Cave of Machpela (known in English as the Cave of the Patriarchs). The Hatzala Yosh organization reported Sunday that Abu Sneina participated in the terror attack on the building known as Beit Hadassah, on May 2, 1980, in which six students from the Nir Yeshiva in Kiryat Arba were murdered. The students were making their way home by foot from the Cave of Machpela, after the Sabbath Eve prayers, when Arabs who had been hiding inside neighbouring houses ambushed them and opened fire. Besides the dead, 16 others were wounded in the attack. Abu Sneina makes no attempt to hide his terrorist past, and actually seems quite proud of it. His Facebook page proclaims that he is “one of the heroes of the operation at Dabuya," as the area of Beit Hadassah is known in Arabic. The cover photo of his profile is of the terror squad that carried out the attack, with Abu Sneina's face circled. MK Yariv Levin (Likud) called Monday on the government to suspend the arrangements it has agreed upon with the PA regarding the Cave of Machpela until the appointment of Taysir Abu Snena is cancelled. The appointment comes only days after Muslim worshippers once again desecrated the Jewish section of the Cave, which is the second holiest site in Judaism after the Temple Mount in Jerusalem. It is the burial place of the Jewish Biblical patriarchs - Abraham, Isaac and Jacob - as well as three of the four matriarchs - Sarah, Rebekah and Leah (the fourth, Rachel, is buried in Bethlehem). The site is usually split between Jewish and Muslim worshippers, but this past Friday it was open exclusively to Muslim worshippers in honour of Ramadan. After Muslim prayers had finished, Jewish worshippers arrived to find that holy items had been stolen or damaged, and that mud and garbage had been strewn across the room. "Appointing a convicted murderer of six young men and putting him in charge of a holy site in the very place where he committed his crime says a lot about the Waqf - who they are, what they are, and what their tendencies are. "I think this is very dangerous. This murderer is is today responsibler for a site frequented by 800,000 Jewish visitors each year. 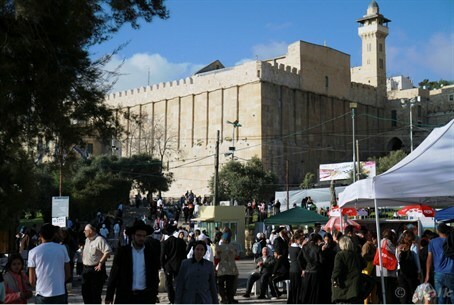 How can the Israeli security services cooperate with the Waqf at all after this? Any control the Waqf has over the Cave, or indeed any other place, should be taken from them by Israeli government." Asked about the ongoing investigation into Muslim desecration at the sight, Wilder echoed the scepticism of other community members, and remained pessimistic about the authorities apprehending any suspects. However, he called for the government to take tough action in response. "Next Friday, the Arabs will gain exclusive access to the Cave again. The government must show that there are repercussions for this kind of vandalism."